Benedict (Baruch) de Spinoza has been one of the most inspiring and influential philosophers of the modern era, yet also one of the most difficult and most frequently misunderstood. Spinoza sought to unify mind and body, science and religion, and to derive an ethics of reason, virtue, and freedom 'in geometrical order' from a monistic metaphysics. Of all the philosophical systems of the seventeenth century it is his that speaks most deeply to the twentieth century. 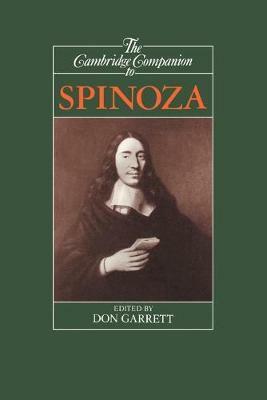 The essays in this volume provide a clear and systematic exegesis of Spinoza's thought informed by the most recent scholarship. They cover his metaphysics, epistemology, philosophy of science, psychology, ethics, political theory, theology, and scriptural interpretation, as well as his life and influence on later thinkers. Introduction Don Garrett; 1. Spinoza's life and works W. N. A. Klever; 2. Spinoza's metaphysics Jonathan Bennett; 3. Spinoza's theory of knowledge Margaret Dauler Wilson; 4. Spinoza's natural science and philosophy of science Alan Gabbey; 5. Spinoza's metaphysical psychology Michael della Rocca; 6. Spinoza's ethical theory Don Garrett; 7. Kissinger, Spinoza, and Genghis Khan Edwin Curley; 8. Spinoza's theology Alan Donagan; 9. Spinoza and Bible scholarship Richard Popkin; 10. Spinoza's reception and influence Pierre-Francois Moreau.